I started with some unscented candles from the Dollar Tree. The Mod Podge was left over from my previous post for photos on canvas. Then, I perused the internet for free printable Christmas sheet music. So many to choose from. 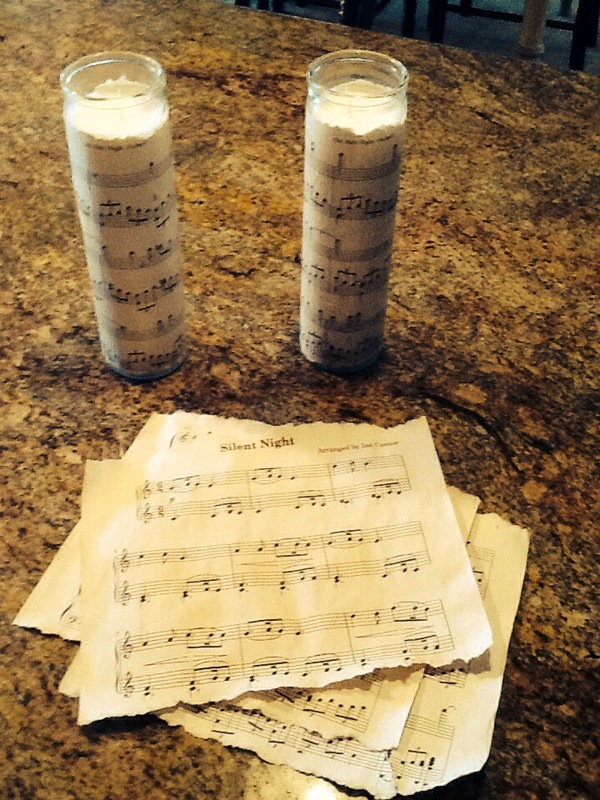 After I printed the music, I ripped the page to size, to fit the length of the candle. Cutting it would have made such clean edges and I was going for a more rustic look. 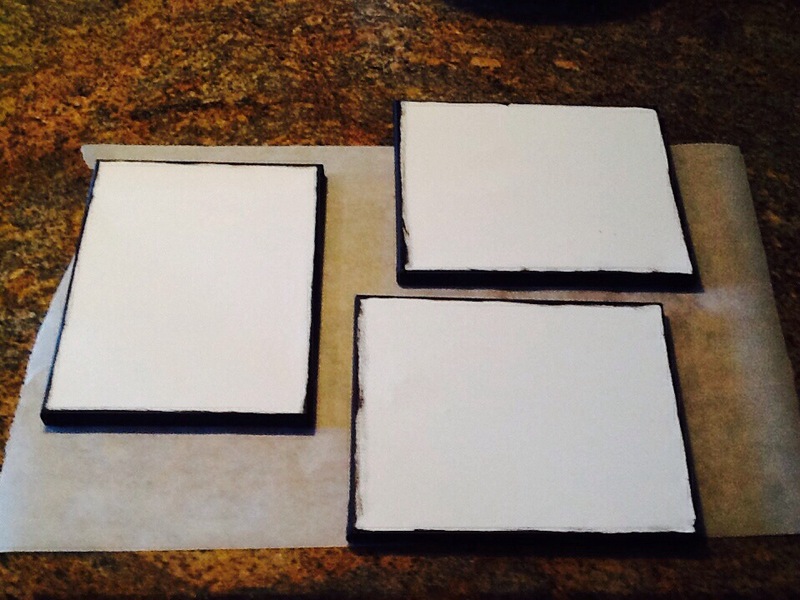 I then antiqued the pages, soaking them in some coffee, and drying them out in the oven. The little jingle bells were also purchased at the Dollar Tree in a pack of 20 I think. 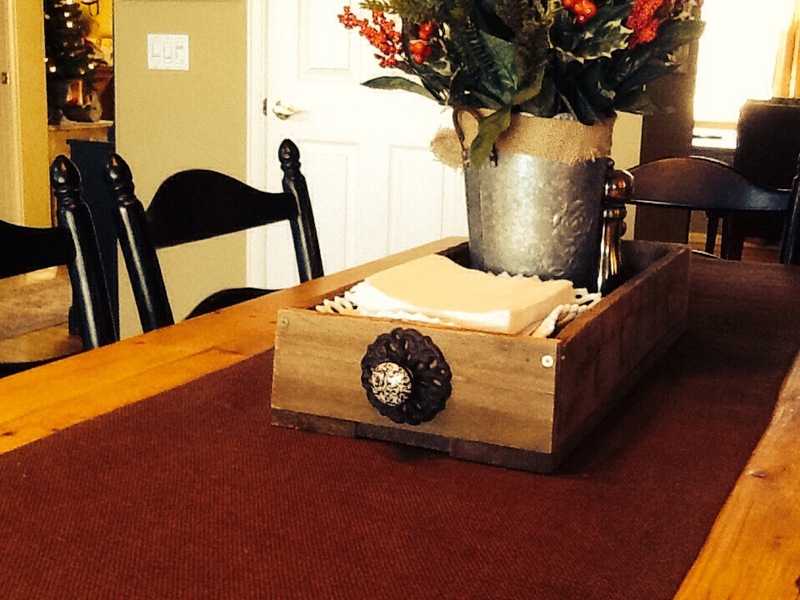 The black burlap and twine were also left over from previous projects. 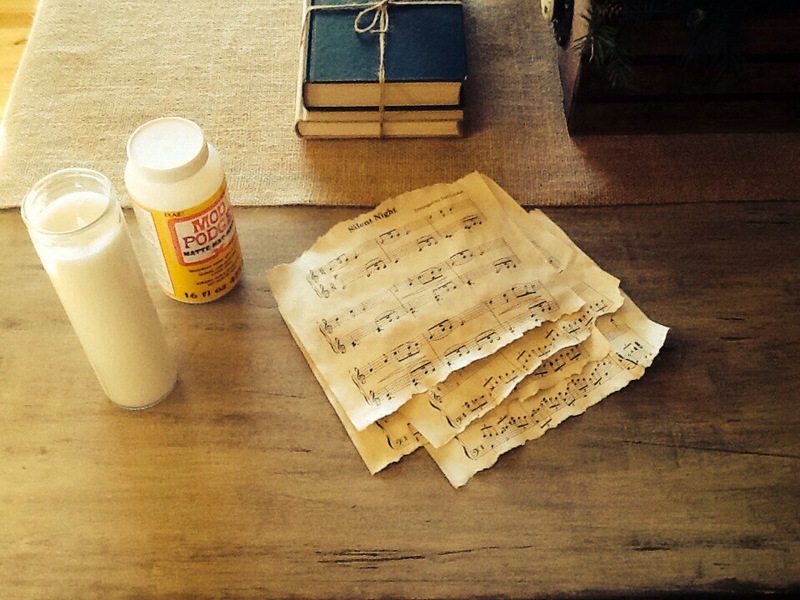 I coated the glass with some mod podge and wrapped the sheet music around it. Let that dry and applied another coat of mod Podge. When that was dry I cut a small strip of burlap and hot clued that on and finished it off with a piece of twine tied through the little bell. Super easy and cheery. 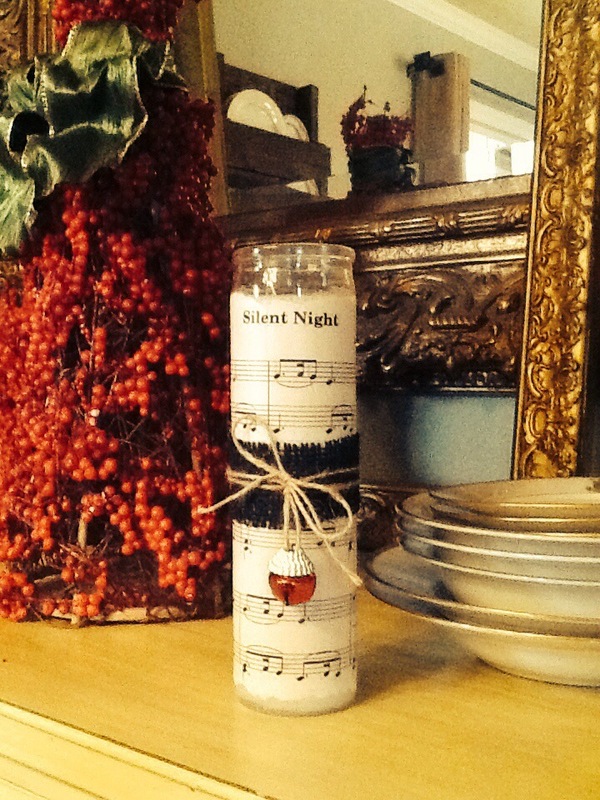 I’m thinking a grouping of these would be super cute with various music titles for different Christmas songs. 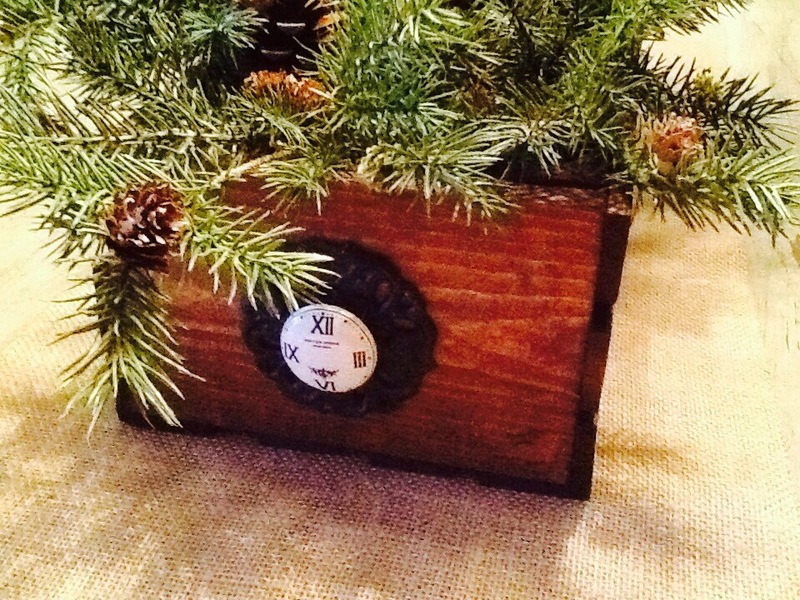 So here is a super easy gift idea. This craft is ALL over Pinterest, so I cannot take credit for the creativity. This was the first time I attempted this though and I must say, I am completely addicted. 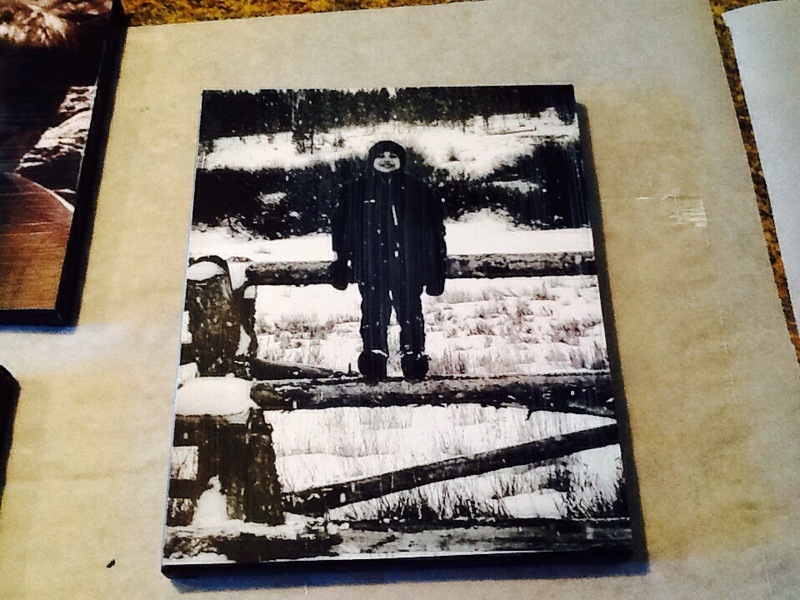 I started off with some blank 8×10 artist canvas (frequently on sale in 2pks at Hobby Lobby and Michaels), Mod Podge -Matte finish, black craft paint, sponge brushes and several black & white photos that I uploaded and had enlarged at Sams Club. I painted the edges of the canvas black and ran the paint just up onto the top flat canvas part. Let that dry. Then, I trimmed my photos to fit, as they were a bit larger than the canvas itself. Layered a good coat of the Mod Podge onto the canvas, positioned my photo onto that and smoothed it out well with my hands. Right after that I painted on another coat of the Mod Podge over the top of the photo. Don’t panic, it will look very creamy and white, but dries clear. 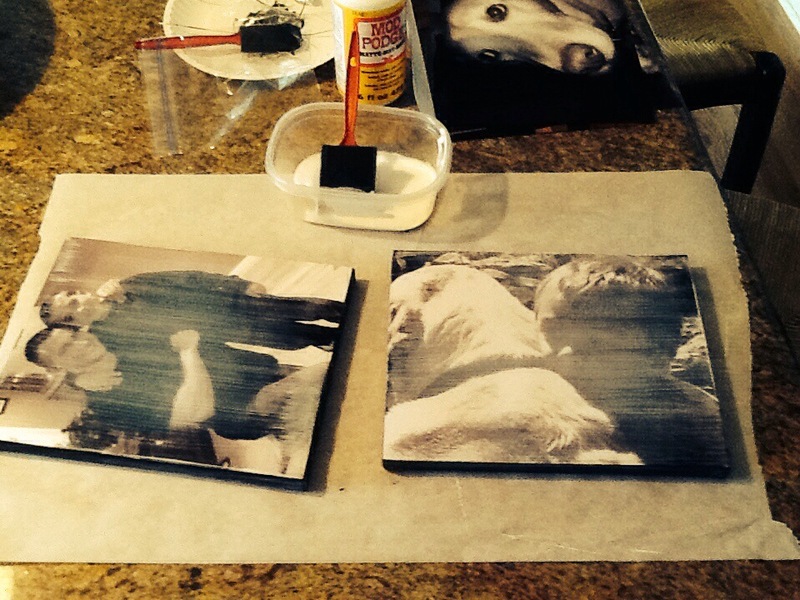 You do have to work quickly to make sure that all parts of the photo are covered smoothly with the mod Podge . DO NOT over work this stuff, as it will get a little clumpy. Once they are completely dry you are good to go. 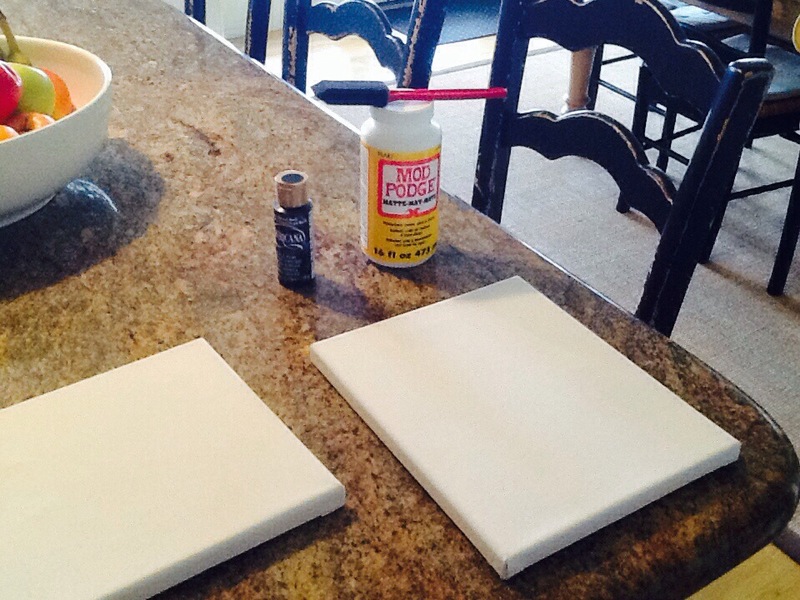 Hang them, do a gallery wall with various sizes, gift them or embellish them for gift giving. 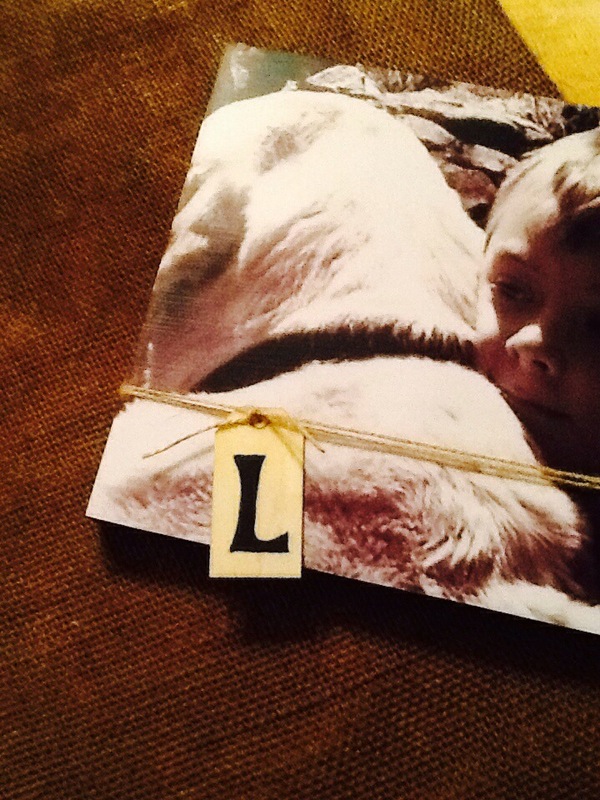 I added a little twine and painted an initial onto a wood chip for one that I am gifting to a friend. Possibilities………endless. The effect that the matte finish gives to the photos is really lovely. It almost looks like the photos were hand painted. Some things are better with a bit of bling. The decorative knobs are not your traditional ‘bling’ (as in, crystals or rhinestones), but it truly adds that little extra something to the ends of my DIY crate. Don’t you think? Now I want to make several more of these and gift them. 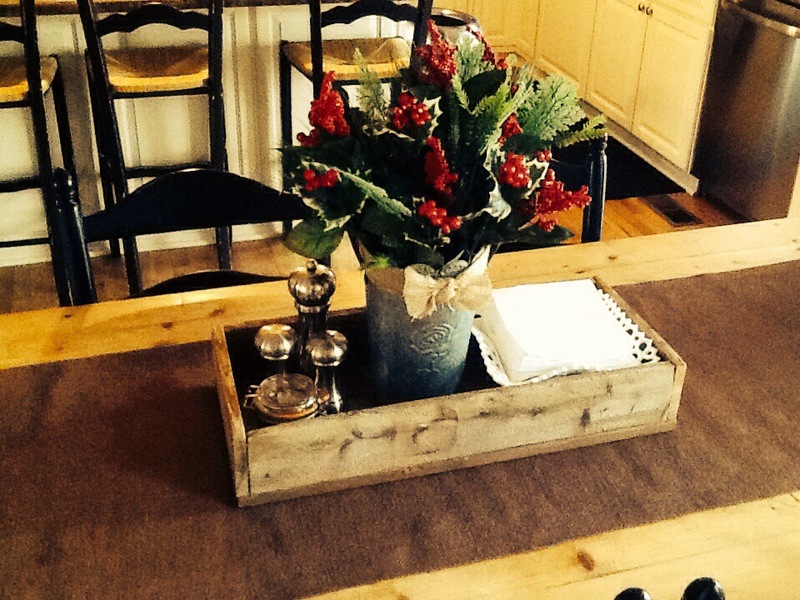 So, yesterday I posted about staining/creating a center piece out of a store bought, pre made crate. Well, I liked it so much that today I decided to borrow some of my handy hubby’s tools and attempt to build my own. I have watched my husband create many things out of wood, so my thinking was……how hard can it be? I know you need to make pilot holes for the wood screws and while I will not attempt to use his skill saw or table saw (without him here to coach me), I figured I could just use a traditional saw to cut some of the wood to size. 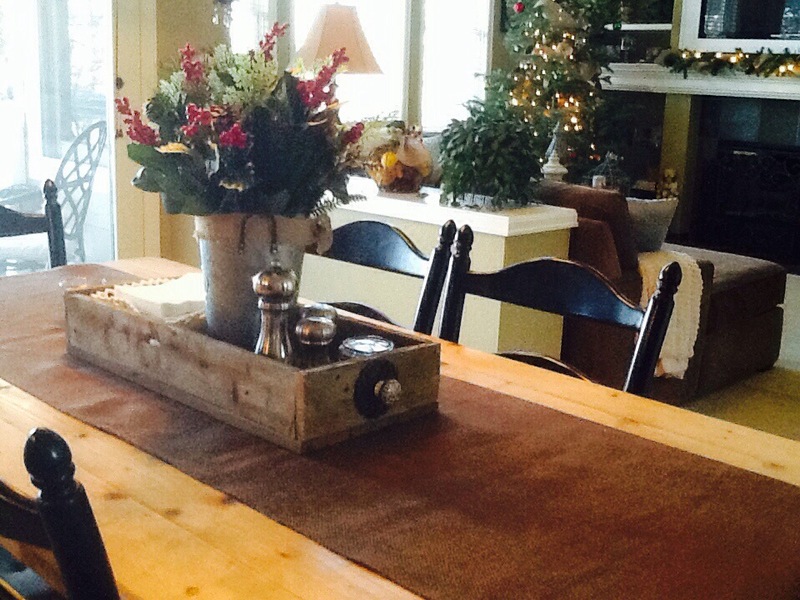 Luckily, the remnant wood I used is from an old low fence that was in part of our yard when we bought this house. 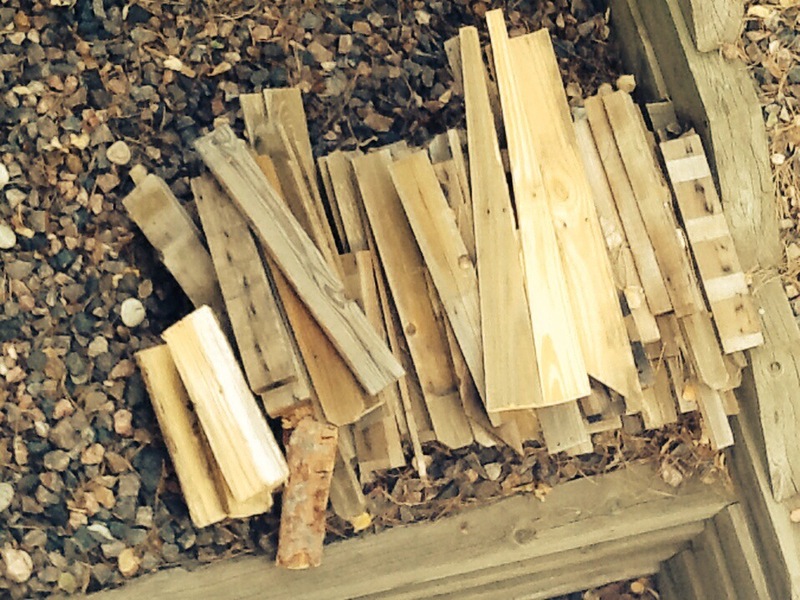 My husband tore down the fence long ago and we stacked and saved the wood. The bonus was having many like sized pieces to choose from. So, I only had to make 2 cuts for the end pieces. Clearly, I am not a professional at construction. I’m all about ‘guesstimating’ lengths and eyeballing the cut. If my husband were here, it would have been incredibly precise. That’s just how he rolls. 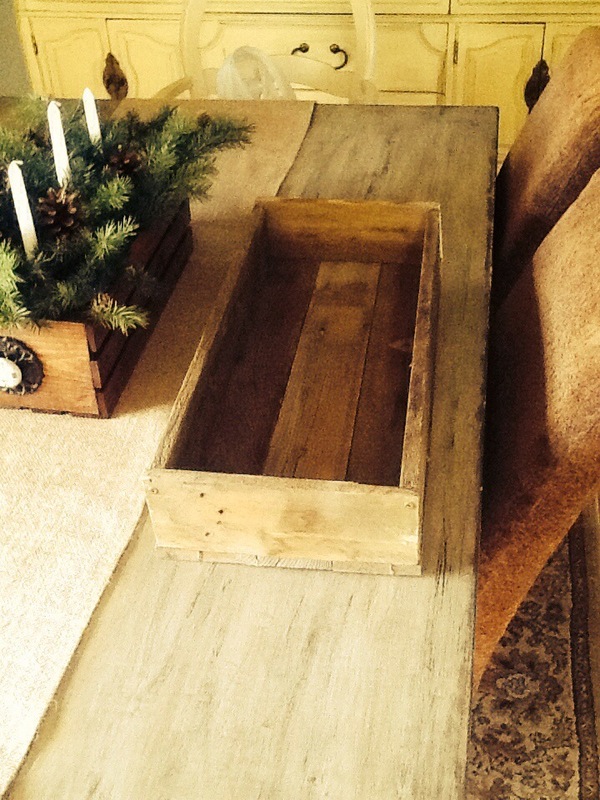 For this crate however, the crude and rustic look is totally me. 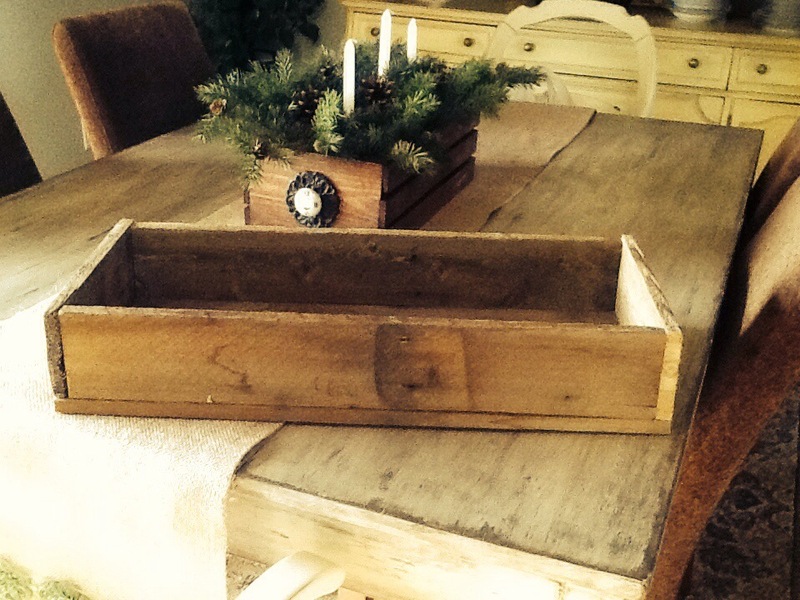 Cost for this shabby chic and rustic gem……..FREE!!! My favorite word. 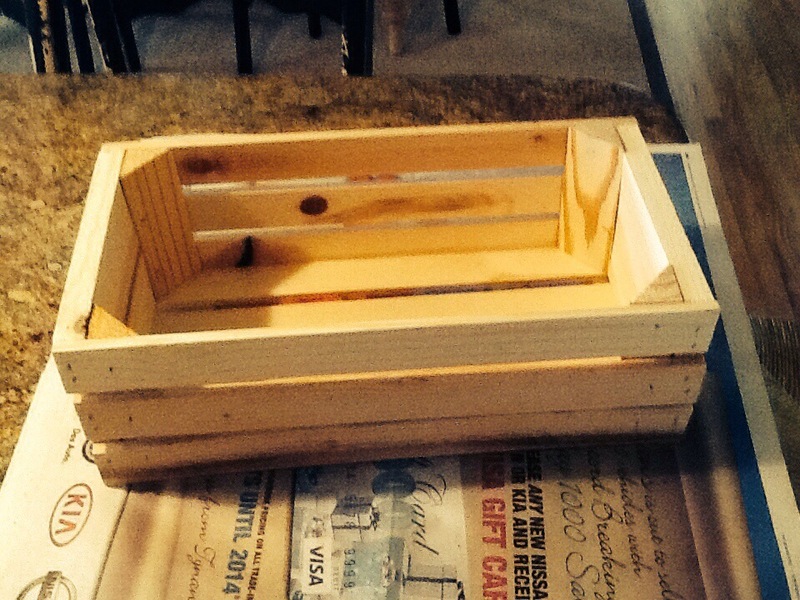 Now, where to put it and what to place inside of it…….maybe I’ll stain it???? Not sure yet! Ladies, you can sooooo do this. Start to finish it took me 30 minutes. For now, this is where the crate will live. Today I completed my decorative crate. 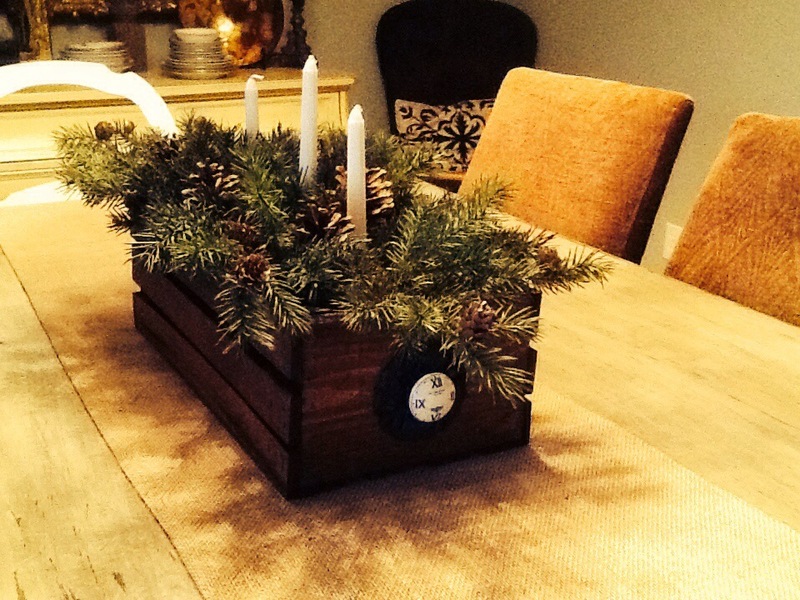 I knew I wanted to create this for the Christmas season to sit as the center piece for my dining table. Normally, these crates run $9.99 at Michael’s…….however, the entire batch was erroneously placed on the wrong shelf, which was marked at $6.99. So the lovely cashier gave it to me for the lower price……that, plus my 25% off coupon – SCORE! I started with this, a blank crate. 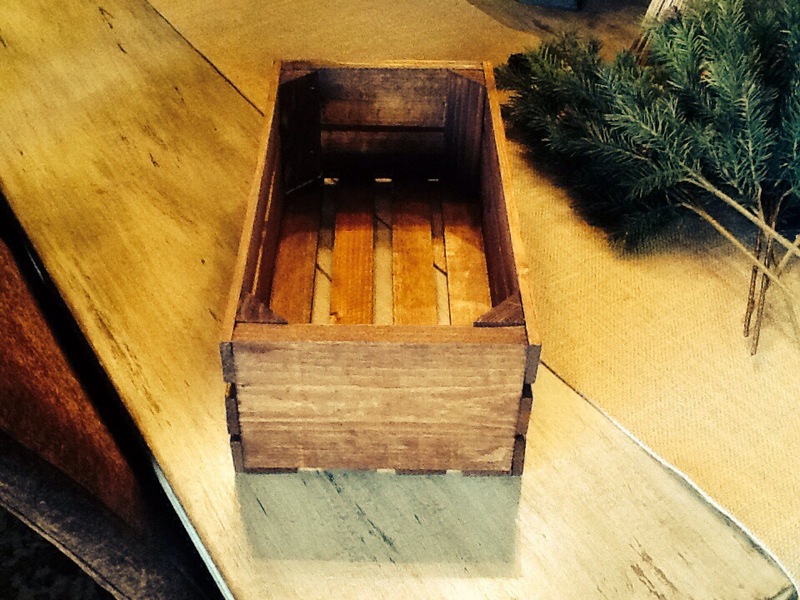 I had several wood stains already on the shelf in my work shop, so I chose Minwax – English Chestnut. It’s one of my fav’s. It’s the perfect wood tone with plenty of warmth. Whipped out a little foam brush and gave the entire crate a good coat of stain inside and out, wiped it down with a rag to remove any remaining stain and set it out on the deck to dry for 24 hours. 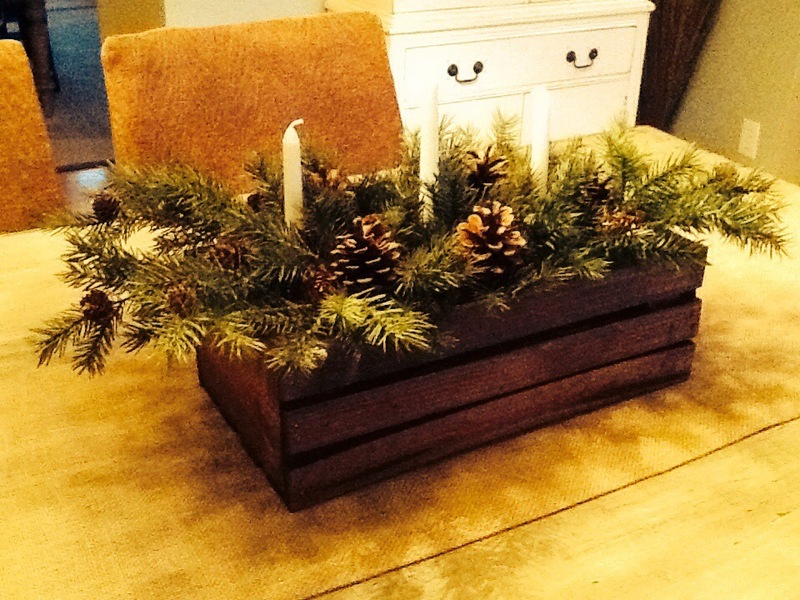 I also purchased the greenery while at Michael’s…..some pine tree sprigs w/ mini pine cones already attached. However, I felt like it needed a little something else. So, today I was in Hobby Lobby, my happy place, and I saw that all of their knobs and things were 50% off (have I mentioned that I LOVE a good discount? 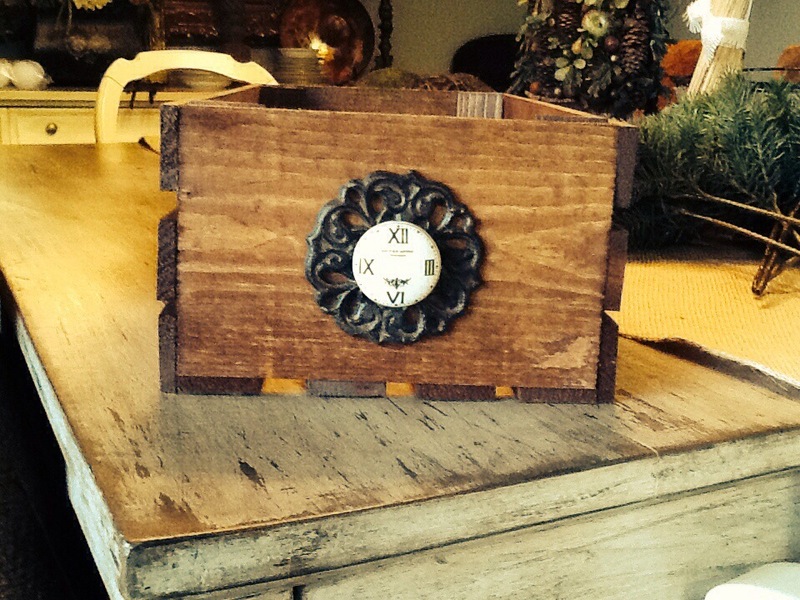 ), so I grabbed a cute iron decorative piece and a sweet knob that resembles a clock with Roman numerals. Centered this 2 pieces in the middle (eye balling it of course), drilled my pilot hole and screwed them in. Placed a piece of floral foam in the bottom of the crate, stuck in 3 pillar candles (from the Dollar Tree) and place my sprigs randomly throughout. 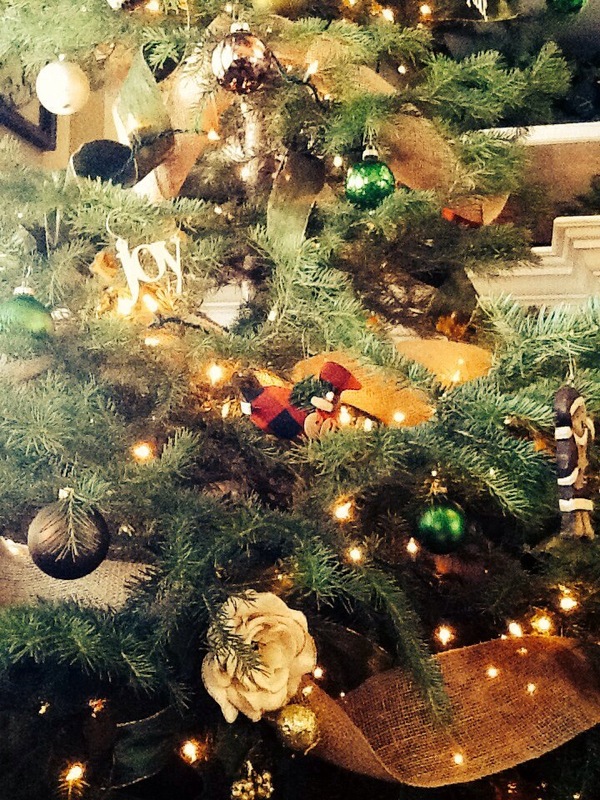 I added the larger cinnamon scented pine cones at the end. So super simple. These would make fantastic gifts…….hmmmmmmm????? 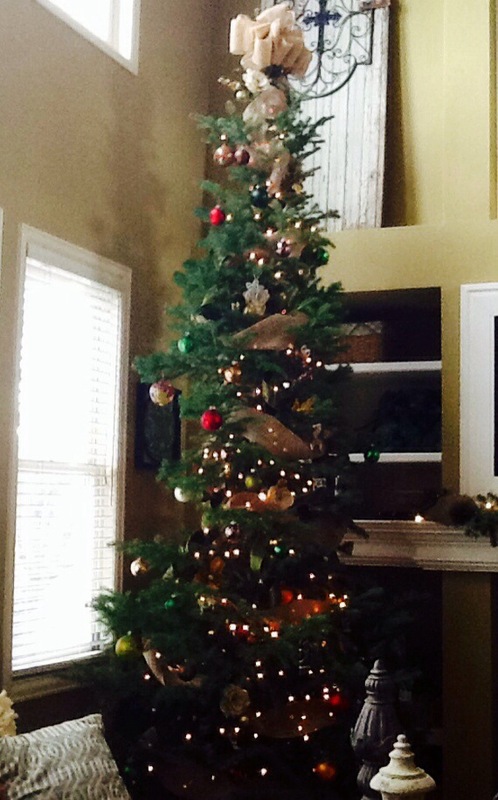 We are in full blown Christmas mode around here. 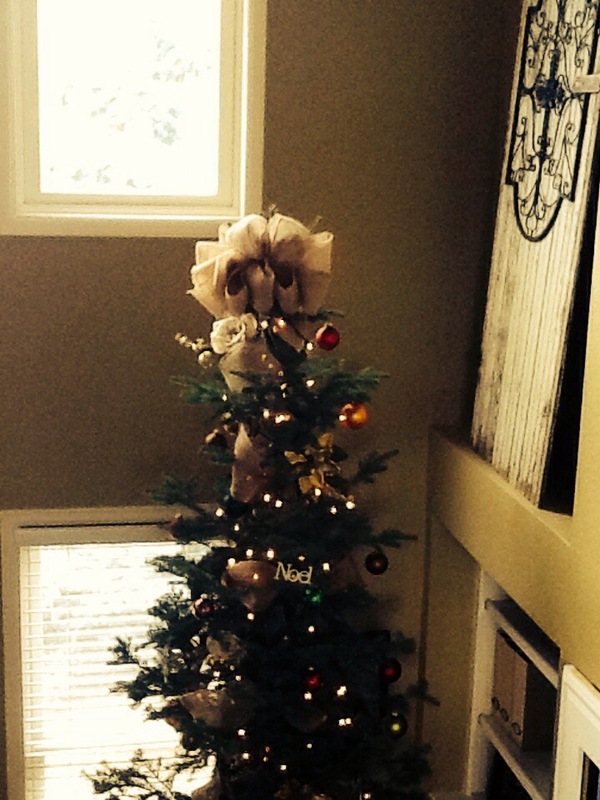 Try as I might, I cannot manage to get a full length photo of our 14 ft tree. So, I have done my best. As well as some close ups. 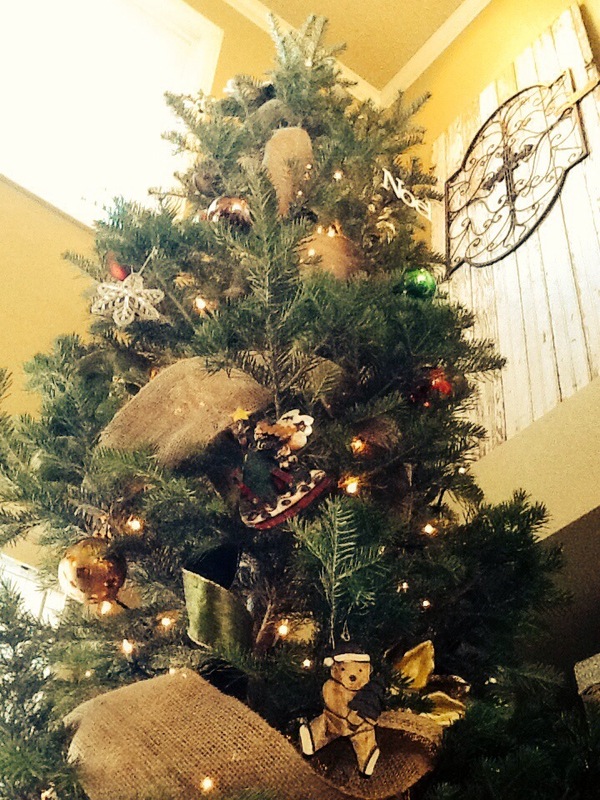 I wrapped our tall narrow tree in lights, a wide natural burlap and some deep green, gold trimmed ribbon. 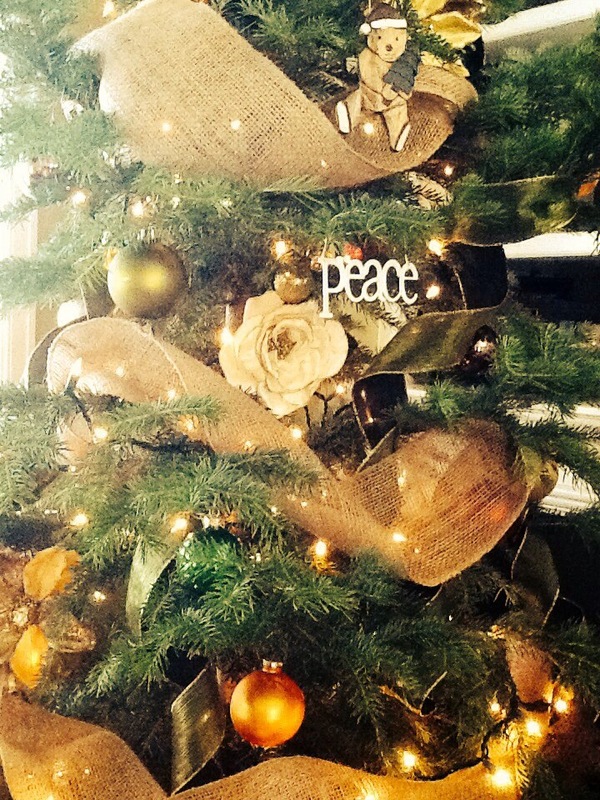 Various ornaments, large flowers and a I made a big burlap bow for the top. 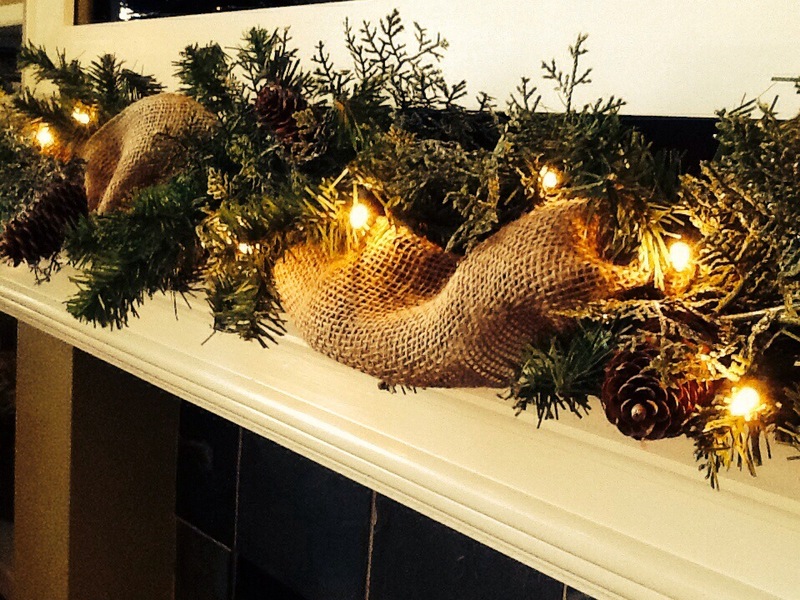 The mantle received some attention too using 2 different garlands, pine cones and burlap. 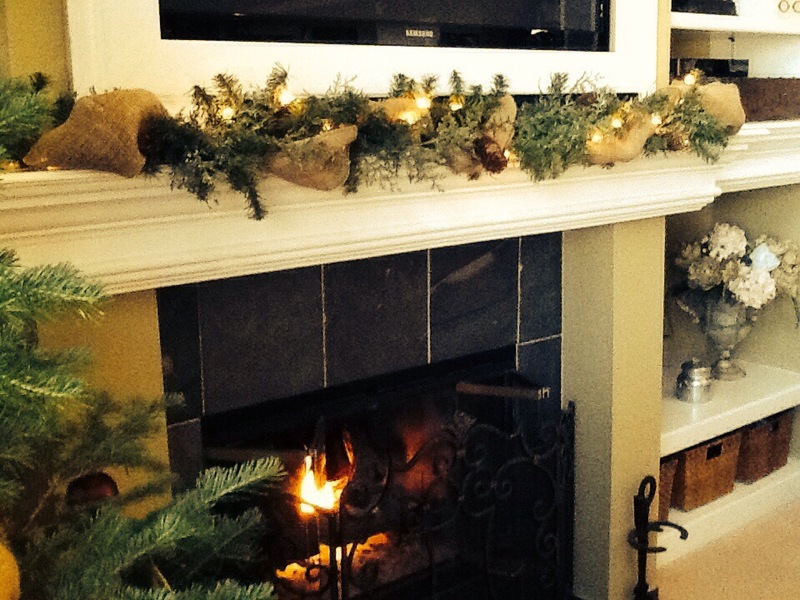 I may add some candles to the mantle……..what do you think? 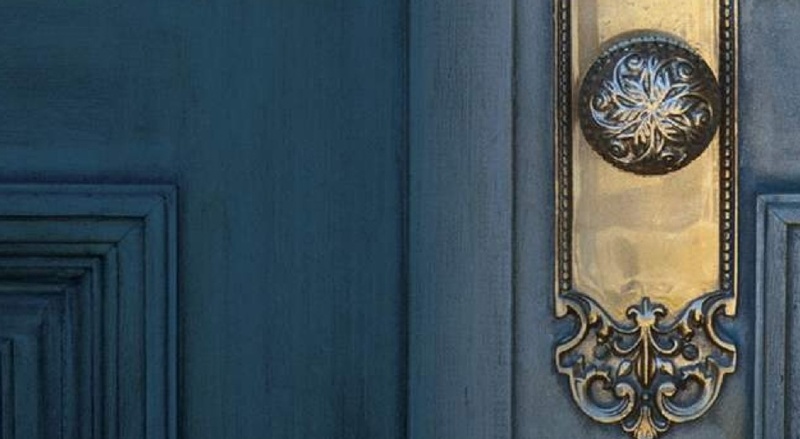 The mid-life adventures of a couple turning the corner, making things beautiful, and learning to be landlords. 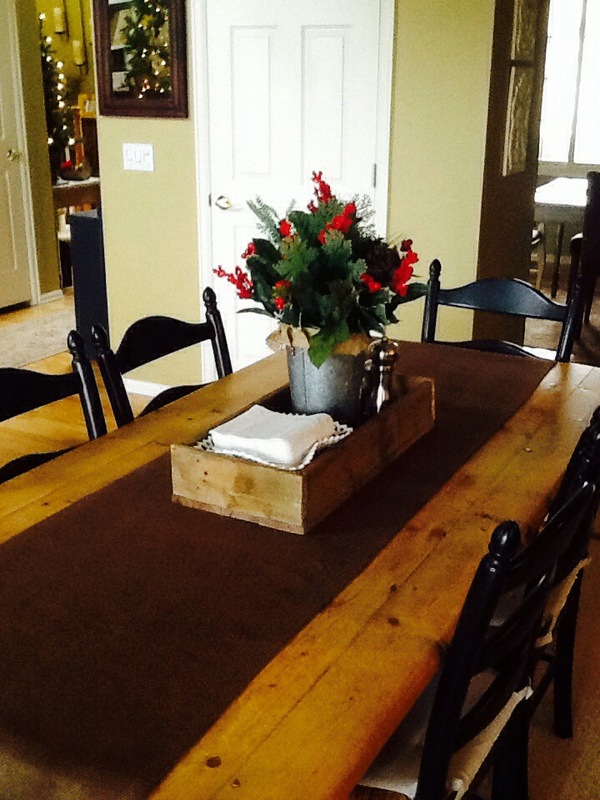 Two friends share their craft and decorating ideas.